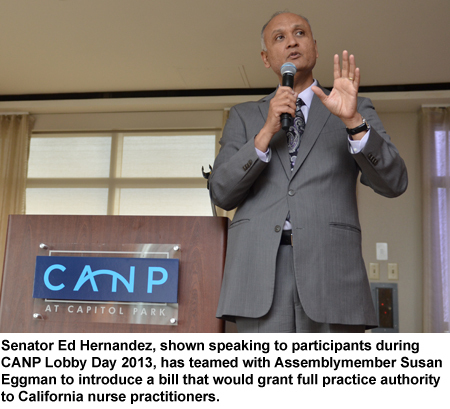 SACRAMENTO – Senate Bill 323 authored by Sen. Ed Hernández (D-West Covina) and Assemblymember Susan Eggman (D-Stockton) that would grant California’s over 18,000 nurse practitioners full practice authority was introduced this week. Read the Bay Area Council study. According to a July 2013 report from the Kaiser Family Foundation, studies have shown that primary care provided by nurse practitioners has been as safe and effective as care provided by doctors. A 2010 report from the Institute of Medicine points to 50 years of evidence confirming that conclusion. SB 323 has been introduced as a “spot bill”, but will be heard in the Senate Business and Professions Committee next month. SB 323 is similar to SB 491 carried by Senator Hernandez in 2013. SB 491 died in Assembly Appropriations. NPs are advanced practice registered nurses who have pursued higher education, a master’s or doctorate degree, and certification as an NP. In order to be more competitive in today’s job market, many NPs now pursue additional specialty education and training in specialties like pediatrics, geriatrics, or women’s health, while many remain focused on providing primary care. NPs play an important role in the health care delivery system and provide care in a variety of settings such as hospitals, community clinics, and private practice settings including in many medically underserved communities throughout the state. The number of NPs have doubled across the United States over the past ten years. In addition, U.S. News and World Report ranked NP as the second best overall job of 2015.